A photographer has won a two-year legal fight against an animal rights group over a "monkey selfie" photograph. Naruto the macaque monkey took the image in the Indonesian jungle in 2011 when it picked up a camera owned by David Slater from Monmouthshire. US judges had said copyright protection could not be applied to the monkey but Peta said the animal should benefit. Peta's appeal on the "monkey's behalf" was dismissed but Mr Slater has agreed to donate 25% of any future revenue. 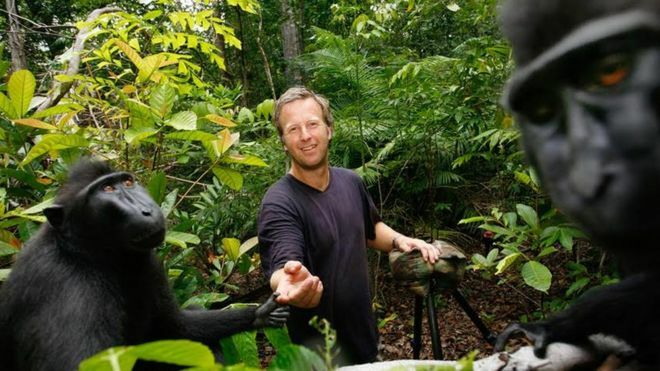 In a joint statement from Peta and Mr Slater, it said the photographer will give a quarter of the funds he receives from selling the monkey selfies to registered charities "dedicated to protecting the welfare or habitat of Naruto". "Peta's groundbreaking case sparked a massive international discussion about the need to extend fundamental rights to animals for their own sake, not in relation to how they can be exploited by humans," said Peta lawyer Jeff Kerr. Mr Slater said that he had to earn the trust of the monkeys over several days before venturing close enough to get the selfie. He said he put in a lot of effort which was more than enough for him to claim copyright. He also said he was a conservationist and interest in the image had already helped animals in Indonesia. The case was listed as "Naruto v David Slater" but the identity of the monkey had also been in dispute, with Peta claiming it is a female called Naruto and Mr Slater saying it is a different male macaque. But appeal judges at a court in San Francisco ruled in Mr Slater's favour after a two-year legal fight. In the joint-statement between Peta and Mr Slater, they say this case "raises important, cutting-edge issues about expanding legal rights for non-human animals".